Featuring premium Moet & Chandon* and Chandon* champagnes, light canapé & live Jazz. It’s once again time to celebrate Friday with the royal drink- champagne! 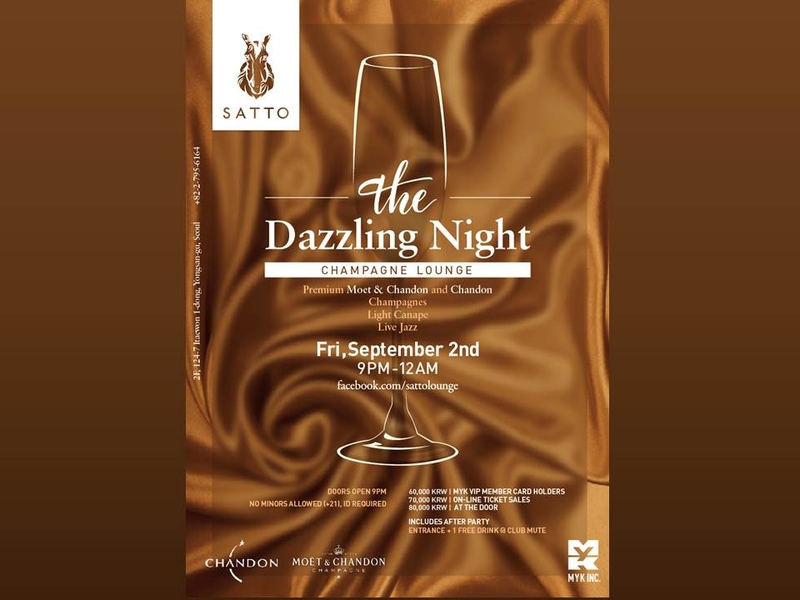 SATTO offers for that incredible drink for just that evening! Champagne bubbles will be stirred by our great staffs. The best party experience is guaranteed in our private and comfortable SATTO area. The king of champagne- a bottle of Moet & Chandon, Chandon will ensure the most royal table that night! Champagne Lounge featuring premium Moet & Chandon* and Chandon* champagnes, light canapé & live Jazz. Mix and Mingle with Seoul’s premier crowd for a “Dazzling” night of bubbles & bling.